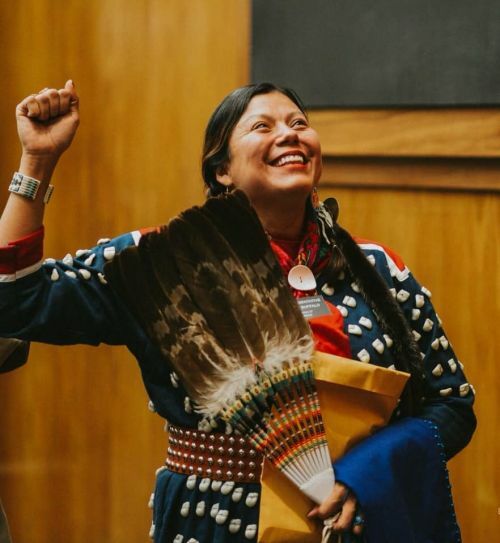 Buffalo, a Democrat, and a registered member of the Mandan, Hidatsa, Arikara Nation, recently made national headlines after receiving permission from the House minority leader and choosing to wear traditional attire to her swearing-in ceremony at the state capitol. The first bill Buffalo turned in will require the state’s criminal justice data information sharing system to include data related to missing and murdered Indigenous people. Basing information from the Urban Indian Health Institute, there were 5,712 reports of missing and murdered Indigenous women or girls in 2016, yet only 116 cases were reported to the federal missing persons database, according to Buffalo. The second bill would authorize training for state’s attorneys and law enforcement officers and officials regarding missing and murdered Natives. The North Dakota Human Trafficking Commission would provide all training. Buffalo has been raising awareness about MMIW issues and human trafficking for years. In 2016, she spoke at the Women’s March in Bismarck, and considers the issue to be of vital importance not only to Native peoples, but to everyone in the nation. “These bills were introduced after meeting with the Attorney General, seeking input from local task forces, and the Human Trafficking Commission,” Buffalo said. Newly elected to the state legislature, the bills are the first Buffalo introduced. The process was complicated, but she’s a community organizer at heart. Connecting with people and bringing everyone to the table wasn’t the difficult part.